Congenital defects of the outer ear are not too uncommon. Such may vary from complete absence of the pinna to various unsightly irregu­larities. Most of these deformities are correctable by plastic operative procedures, but each case varies in deformity and procedure so that to outline a general approach for all cases would be formidable. Suffice it to say that most ex­ternal ear deformities are amenable to various one-, two-, and three-stage plastic procedures. In the one common deformity of protruding ears, or lop-ears. In the case of complete absence of the auricle, a prosthesis (artificial part) may be prescribed, often held in place by spectacles. Congenital defects affecting the deeper ear parts and impairing hearing are usu­ally not correctable, but more recently great strides have been made in helping the congeni­tally deaf child to pursue a relatively normal life. Foreign bodies in the ear canal are not un­common, especially in children. Infection may develop around such foreign object. Treatment rests with mechanical removal, preferably early. Impacted wax (impacted cerumen) is a fre­quent affection of the ear. Excessive amounts of cerumen are produced by many individuals which clogs the canal. Itching of the canal and consequent attempts to scratch with the blunt finger often impact the wax into a hard obstruct­ing bolus. No harm results from an ear canal obstructed by cerumen, except that hearing is impaired as sound waves cannot reach the drum. This condition is treated by irrigation (wash­ing out) of the ear canal by a physician. No attempt should ever be made by an individual to clean out or to scratch within the ear canal. The drum is a delicate structure and may be in­jured. It has been said that nothing smaller than one’s elbow should ever be put in the ear! Injuries to this system are quite common, par­ticularly to the auricle. These should receive prompt repair to avoid cosmetic deformity. In­juries to the deeper ear parts are usually the result of severe blunt blows, such as from auto accidents, and usually are associated with skull fractures. Tumors of the ear system command essen­tially the same principles of those of other areas. The same cysts and tumors which involve the skin elsewhere may occur on the skin of the pinna, and sebaceous cysts of the outer ear are common. Tumors, either be­nign or malignant, of the inner structures are not frequent. However, when they occur early re­moval is imperative. Benign tumors must be removed before they proceed to impair the hear­ing sense, and the malignant growths must be removed for this reason as well as to preclude their spread to other parts. In the case of the latter, the sense of hearing may have to be sacrificed. affecting the system. The skin of the auricle and the canal is subject to inflammations, rashes, and furuncles as is the skin of other areas. Infection of the ear canal is called otitis ex­terna. This may be bacterial or fungous, the latter being a prevalent chronic disease, espe­cially in warm climates. Treatment is usually by application of topical remedies. Middle ear infection is called otitis media. This is a rather common disease especially of children, and usually is associated with nose and throat infections (for example, “colds”). Formerly this was a serious disease, as destruc­tion of the middle ear parts resulted as the disease proceeded unhalted; however, more re­cent treatment with antibiotics which promptly kill the offending germ has made complications from this disease less frequent. 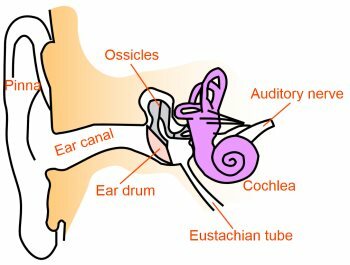 Occasionally pus formation within the middle ear spontaneously ruptures through the drum to cause the “drain­ing ear,” or small incision into the drum may be necessary. Such opening in the drum even­tually seals itself as the infection subsides, and the hearing apparatus is returned to normal. Scarring in the middle ear from healed in­fection which results in immobilization of the bony chain (hammer-anvil-stirrup chain) and consequent hearing loss, has more recently been amenable to a new surgical procedure. The stapes mobilization operation is performed by incision through the ear drum with mechani­cally loosening the fixed bone. Results have been encouraging in patients deafened by pre­vious otitis media. When the eustachian tube is blocked, such as commonly occurs with “head cold” or en­larged adenoids, the air pres­sure within the middle ear may be greater or lesser than the outside air pressure and the drum may bulge or retract. Drum vibrations cannot be normal, so hearing impairment and pain result. This is known as “air otitis” (or aero-otitis) and is a common disorder among aviation personnel. Eustachian catheterization and insufflation may be necessary in the chroni­cally blocked tube. Acute or chronic otitis media may extend back to the mastoid air spaces to set up acute or chronic mastoiditis. Again, prior to the age of antibiotics and other modern drugs, this was a serious complication. The operation mastoid­ectomy was often the only course of cure. This operation essentially entails the removal of the major portion of the mastoid process by chisel­ing away the infected bone. Formerly a very common operation, it now is rarely necessary. Postoperatively there remains a bony concav­ity where the mastoid protuberance normally exists, but such minor deformity justifies the life- saving mastoidectomy. Unhalted, mastoiditis may proceed to brain abscess, meningitis, brain blood clots, or serious bone infections. Inflammation of the internal ear cavity is called otitis interna and labyrinthitis. Hear­ing and/or equilibrium may be affected, usually both. The disease may be acute or chronic. (A bizarre, not too well understood, chronic form is known as Meniere’s disease, a commonly diagnosed disease.) Medical treatment is usu­ally indicated. A chronic progressive deafness condition, frequently encountered in older age, is called otosclerosis. In this condition a deposit of bone around the base of the stirrup at its contact with the drum develops so that vibrations are prevented from reaching the auditory nerve ele­ments; deafness results. The disease is progres­sive. Formerly little could be offered patients suffering from otosclerosis. However, in recent years the fenestration operation has been de­veloped to alleviate this type of deafness. In this procedure a conduction channel is restored around the obstruction which permits the sound impulses to reach the perceptive mechanism of the inner ear. This is accomplished by approach through the mastoid body and the construction of a skin flap over a newly created window (fenestra) into the internal ear. Excellent results have been obtained by this intricate plastic pro­cedure in a high percentage of cases. Acoustic neuritis is an inflammation of the hearing nerve from any of several causes. Often it is from nonapparent cause but may occur as a result of drugs, poisons, allergies, infections, or in association with other body diseases. Symptoms of tinnitus (ringing in the ears), diz­ziness, hearing loss, and pain may result. These may be momentary or persist for weeks. Treat­ment rests with removal of the cause and other medical measures. Deafness in the aged occurs as result of hard­ening of the arteries with lack of blood supply to the ear parts, from hearing nerve degeneration, or gradual destruction of the vital hearing parts. In cases where medical and surgical measures cannot improve the hearing sense, artificial hear­ing aids may be prescribed to augment air or bone conduction of sound waves to the hearing nerve.